This article appeared in the Trinity News of 24th April, 2007, and is reproduced here with the permission of the author. What is real tennis? Real tennis is the original racket sport which provided the foundation from which such games as lawn tennis and squash developed. Aspects of the game may appear complex at first, so the aim of this article is to show why it is so interesting and why it is so enjoyable to play. 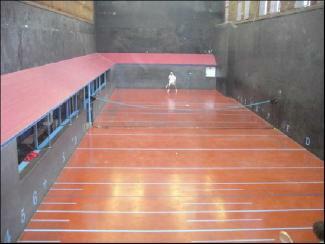 Real tennis is played on a court of a similar size to a lawn tennis court. The real tennis court, however, is fully enclosed and is asymmetrical. On three sides (at both ends and along one side) are ‘penthouses’, sloping surfaces which are part of the playing area. On the fourth side is a flat, vertical wall. Flat, that is, except for the presence of the ‘tambour’. The tambour is a buttress protruding from the otherwise smooth, the effect of which is to change the line of flight of any ball which strikes it, often shooting the ball sharply across the court from one side to the other. Real Tennis in all of its rather unfamiliar glory. During a lawn tennis match the players change ends every two games, and the most prominent difference between the ends is usually related to the position of the sun. At real tennis, in contrast, there are particular advantages to be gained from retention of the service end, and a change of ends — and of serve — must be won by the receiver. In fact a whole match might be played without a single change of ends, although this would be unusual. The two ends of a real tennis court are different. They are referred to as the ‘Hazard End’ and the ‘Service End’. As the name suggests, all serving of the ball is done from the service end of the court. The service end may be contrasted with the hazard end, at which service is received, and at which are to be found a number of features which add to the accuracy of its description, not least the tambour, mentioned above. The ball approximates to a cross between a lawn tennis ball and a sliotar. Each ball is hand made from cork wrapped in cotton tape, with a hand-stitched felt cover. The ball is quite heavy (it hurts when it hits you!) and takes spin very well. Real tennis rackets are wooden and slightly asymmetrical — a characteristic which means that the sweet spot is closer to one edge of the racket head, which is useful because the real tennis ball tends to stay low and one therefore plays many shots close to the floor. The main aspects of the scoring system would be familiar to lawn tennis players, as lawn tennis borrowed the terms and structure long established in its parent game. Points are therefore counted in the ‘love — 15 — 30 — 40’ sequence, with the winner of six games taking the set. A distinctive means of winning points is afforded by each of three parts of the real tennis court. If the ball is played from the service end into the ‘winning gallery’ or the ‘grille’ at the hazard end, and if the ball is played from the hazard end into the ‘dedans’, it is a winning shot. The dedans is an opening at the back of the service end below the level of the penthouse. It stretches most of the width of the court from hip level to just above head height. The grille is a square recess, with sides some 1m long, located at the hazard end below the penthouse and against the main wall (i.e. just beyond the tambour as viewed from the service end). The winning gallery is one of a series of openings in the wall opposite the tambour at the hazard end. It is the opening furthest from the service end and usually contains a bell which rings to mark the success of an accurate — or lucky — shot into its net. There is another extra element to the scoring of points in real tennis. This revolves around markings on the floor at the service end, which indicate the distance in yards from the back of the court. If the ball is not struck before its second bounce the distance in yards of that second bounce from the back wall is noted and a ‘chase’ is called. Although the player failed to hit the ball he has not lost the point. When the chase is to be played off, the players change ends, and in order to win the chase (and thus the point), the player who conceded the chase must play the ball so that its second bounce is closer to the back wall than that struck shortly before by his opponent. A chase at the hazard end, or hazard chase, is also possible but occurs less frequently. As there is a significant advantage to be had by the server, retention of the service end is often the priority. Chases are played off in two situations: at game point any outstanding chase must be played off; and in the course of a game when two chases have accumulated they must be played off in sequence, one after the other. Now that you have read this short introduction to the game, the key question must be - where can it be played? Alas, there are no active courts in Ireland. In fact, there are fewer than fifty in the entire world. Some 25 of these are in the United Kingdom. Two courts are known to survive in Ireland, although neither is currently usable. It seems that there were once many more courts in different parts of the country over the centuries — real tennis is a game, after all, which has been played at least since later medieval times, and the oldest court still in use — in Scotland — dates from the sixteenth century. There seems once to have been a court in Trinity College, on or around the site now occupied by Aras an Phiarsaigh. Of the two surviving structures one is on Lambay, the island off the north county Dublin coast. As well as being one of only two courts in the world open to the sky, its layout is somewhat unorthodox. The other is on Earlsfort Terrace and is currently occupied by the civil engineering department of University College Dublin, which has used it for some years as a laboratory. However, UCD is to vacate its Earlsfort Terrace premises — thus completing the move to Belfield started in the 1960s — by the end of 2007. Opportunity knocks! It is the hope of many, in Ireland and internationally, not least the Irish Real Tennis Association (IRTA), that the court will be restored to its former glory — it was after all the venue for the World Championships in 1890 — and reopen for the playing of real tennis after a 70 year pause between games. The establishment of a Dublin University Real Tennis Club is envisaged, and it is hoped that it would be in a position to organize events later in 2007. To start with the Club would arrange trips in conjunction with the IRTA to courts in the UK, in France, and perhaps further afield, to afford Trinity students the opportunity to play this excellent and fascinating game. Indeed, a group from the Dublin University Squash Rackets Club has already sampled real tennis: College squash players, in Oxford in January 2007 to play squash against the locals, took the opportunity to try real tennis — and all look forward to playing again before long. The game is growing in popularity internationally as well as in Ireland, where the return to use of the Earlsfort Terrace court not only provide Irish players with a home venue, but would also attract visitors from all corners of the real tennis playing world. To find out more about the sport look at www.irishrealtennis.ie; type ‘Real Tennis’ into youtube to see video coverage of IRTA members playing on the Newcastle and Cambridge courts; and then sign up to the IRTA and join a trip to try your hand on court! For more information contact dlowry@tcd.ie [or contact the IRTA directly].